How to combine Facebook and Twitter ? Facebook and twitter area the same social networking tools that very popular today. Because the functions are very important, these two tools cannot stand on its own because each has advantages and disadvantages. The strength of facebook are because have more complete tools than any other friendship networking such as friendster or myspace, and twitter has simplicity, real-time messaging, and easy to follow another twitter account. If we can combine facebook and twitter maybe, it will have greater function. b. It will appear an image like this, the login page to twitter. To combine facebook and twitter we only need to enter twitter user name and password on this form. c. Twitter platform will appear in facebook. We will see a form of twitter but in the facebook account. 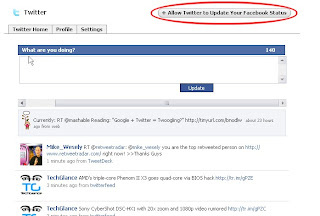 Clik at “allow twitter to update your status”. 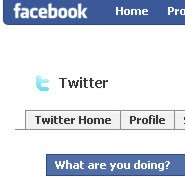 d. We will see tiny icon appear in facebook like this image. 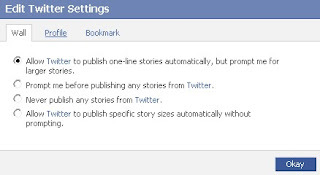 For editing facebook setting then click at "edit". e. Finished combining twitter and facebook. If we try to make a post at twitter then will automatically make a post on facebook wall. We can edit setting twitter on facebook by click "edit" icon then search twitter icon. Click at "edit setting", then will appear image like this. Pick setting as your favorite. Yup, It's an easy way to combine twitter and facebook. if we create a posting on twitter will be show up to facebook. Although, it seems only one way from twitter to facebook, not to twitter from facebook but it's not too bad and very useful. If we have many friends on facebook and lot of followers on twitters, it would be effective if facebook and twitter is combined. Thanks alot n have a good day.